Nokia 808 Pureview 41Mp Mobile Price in India | Free Pc to Phone Calls, Free Voip Calls to India International ! Nokia 808 Pureview is one mobile phone which has already made a lot of hype. This 41 Mp camera mobile phone by Nokia was recently launched in 2012 Mobile World Congress in Barcelona. 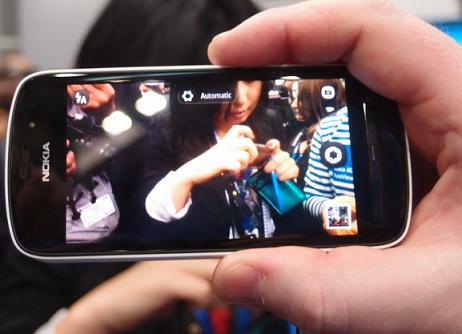 Nokia Pureview is the world's first mobile to have a camera of 41Mp. Nokia Pureview is sure to give a tough competition to other similar phones, but it seems to be a clear winner. Nokia is trying every way to again capture the mobile market which it lost to Samsung and HTC (and off course Apple iPhone). Today lets look at this Nokia 808 Pureview Mobile, its features, its expected date of launch in India, and its expected price in India. High speed processor 1.3 GHz ARM processor. Talk time (3G network) 6.5 hours, standby time up to 540 hours. Capture image data from 7 adjacent pixels compressed in to one ‘pure’ pixel by using 41 megapixel sensor, plus excluding the visual noise present in other normal mobile phone cameras. Carl Zeiss optics and Xenon flash supports the devise. The Nokia 808 Pureview mobile is expected to get released in May 2012. This mobile should be available in India at the same time. In Europe it is expected to be at around 450 Euros, in USA at $600. Nokia Pureview is expected to be priced in India at around Rs 30000. Are you waiting for this amazing phone : 41 Mp Nokia Pureview (Lets see how pure it turns out to be! ).